Product Standard:It meets the requirements of the 《Regulations for the statutory surveys of fishing vessels(2000)》of P.R.C.Fishing vessels. 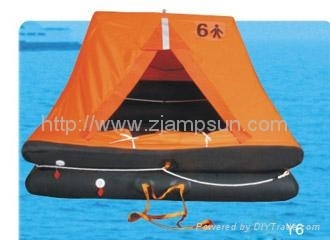 Inflation method:After throw-over from ship.the liferaft can be inflated and opened automatically.If the ship sinks very fast and the liferaft can not be thrown-over.the raft still can float up from water under the action of HYdrostatic release Unit and can be inflated and opened automatically. Max.Storage Height:The installation heigh is 18 m from the water surface. Register of fishing vessel of P.R.C(ZY).